Strategic themes (or objectives) can help you group and organize related initiatives that work together to deliver a specific, valuable business result. Strategic themes can help to simplify the communication of the strategy map to stakeholders by providing a concise bridge between mission and vision, and the details on the strategy map (i.e. the strategic initiatives and portfolio items). Portfolio Hierarchy Goals are one of the fundamental building blocks of your strategic plan. In Targetprocess, you can create business themes based on your goals, specify their details, and break them down into initiatives to meet your objectives. 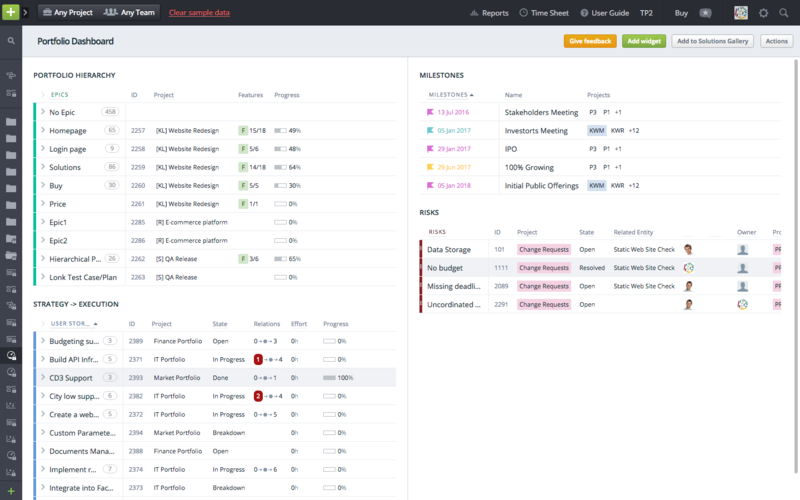 Portfolio Kanban Portfolio Kanban is an Agile way to manage your portfolio. 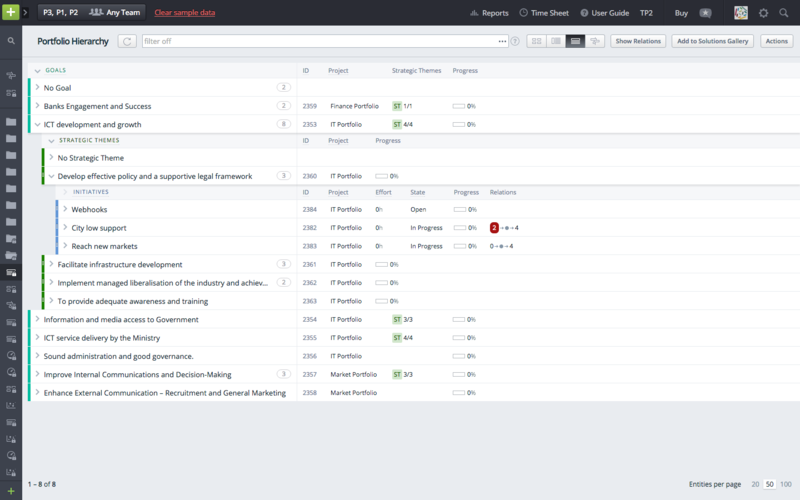 Easily visualize the state of all your initiatives and manage WIP Limits. 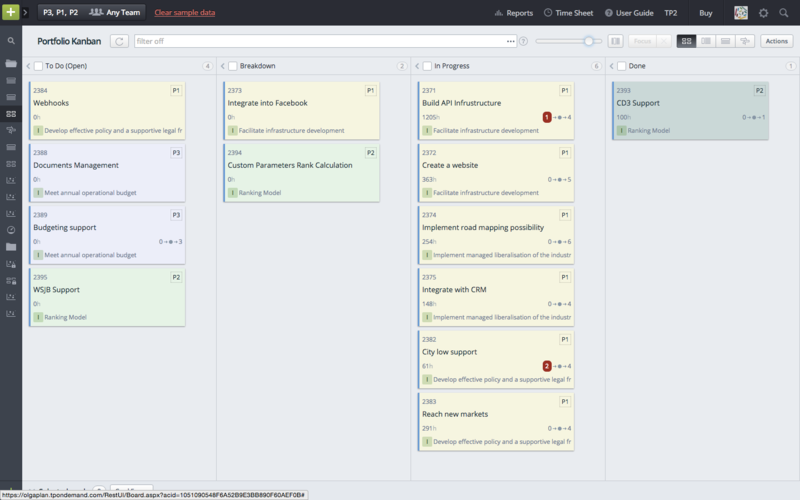 In this example, each initiative is represented as a card on a portfolio Kanban board. For every item, you can see which part of the company portfolio it relates to, what state it is at, and if there are any related risks. 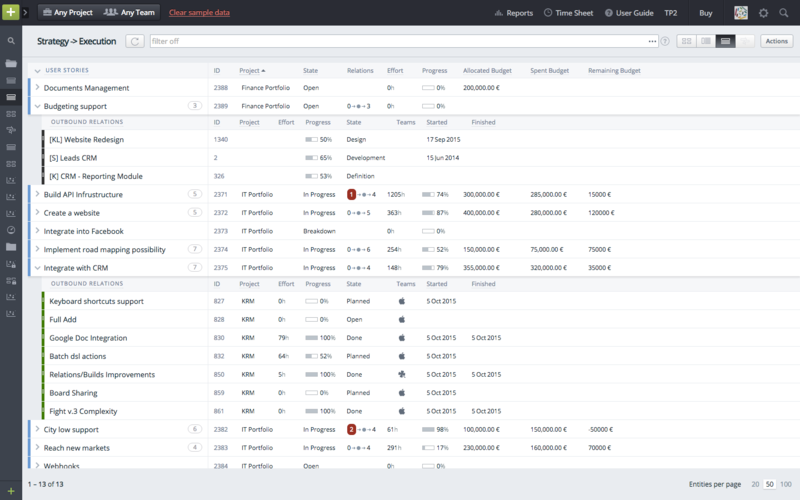 Portfolio Roadmap The Portfolio Roadmap view allows you to see and plan initiatives in terms of time so you can stay on track with important company milestones. 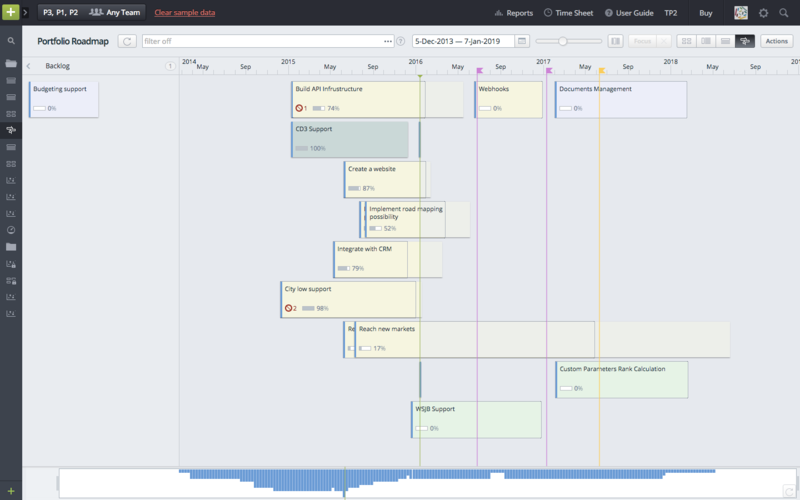 Here you can drag and drop initiatives from the backlog onto the timeline and specify when you plan to start and complete it. You can also visualize any delays in a portfolio's execution compared to the initial plans. Strategy - Execution As soon as high level priorities are defined, we can break down initiatives into work items - projects, epics, features or even smaller items such as user stories - to provide a clear visibility into which exact work items should be completed to reach business initiative goals. Risks Risk management in Targetprocess helps to identify potential problems earlier in the project lifecycle by providing users with visibility to potential risks so they can take corrective action before there is any impact on financial results. For every initiative, you can specify possible Risks. They will be visible right away on a Portfolio Roadmap view as well as on a Risks view, where open risks are shown as a list with their state and a responsible person. 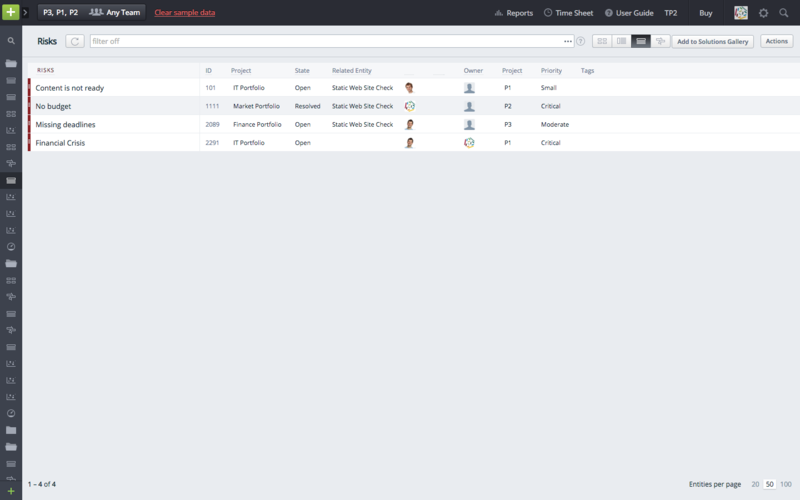 Portfolio Dashboard The dashboard will help you to get all your details on one screen. Keep in mind that there are many more custom reports which can built in Targetprocess to reflect your unique company structure, goals and needs. The aggregated information can be put onto a dashboard to see all important details in one place and allow easy sharing of data with stakeholders. Here you can overview Risks, Strategic Themes and Portfolio Item details, and upcoming milestones. You can create other custom dashboards or add more custom widgets to the sample dashboard to reflect your personal preferences in Targetprocess. The solution can be activated by Administrators of your Targetprocess account. Install the solution from the Solutions Gallery. Navigate + Create > Browse Solutions Gallery item in the left menu for this purpose. Open Portfolio Management folder, select Goals, Strategic Themes and Initiatives Management solution and press green button Try the solution. All views and data adjustments will be perfomed automatically. If you use Targetprocess hosted on-premise, the Solutions Gallery mashup has to be installed in advance. The Portfolio process and a project, related to this process, are required for this solution. If the Portfolio process already exists in your account, then the existing process and the projects related to it will be used for this solution. If the Portfolio process exists, but there are no related projects, then a new project Portfolio will be created in your account. If the Portfolio process does not exist, a new process Portfolio and a related Portfolio project will be created in your account. However, these checks and actions are not performed automatically when you install views from the solution one by one. Contact our Support Team should you encounter any issues on this step. The solution creates 6 private views in your account. Further you're welcome to share them with members of proper Projects and Teams. Projects of Portfolio level only must be selected as current in the setup of all created views. If you already have Porfolio level projects and they are hidden from Portfolio views then you're welcome to modify the views and include required projects into the selection on them. In the meantime please do not mark any Execution / Work level project as current on the Portfolio views. We recomend to install and use custom mashup (add-on) named "Portfolio Tab" with this solution for better user experience. Please contact your dedicated Targetprocess Product Specialist to get additional information.